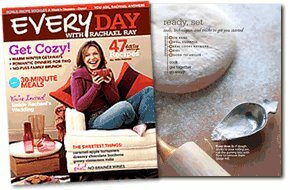 Rachel Ray was touched by the magic wand of Oprah. She had the show on food network but once Oprah sang her praises on the Oprah show she has exploded. I like to watch her show but if you think the evoo thing is annoying to read try hearing it 10 times in a 30 minute span. I like that she cooks real food with ingredients I am likely to have and you can cook it in 30 minutes or less. Ex boyfriend on TV? Is he someone famous? OMG on the ex-boyfriend. That is pretty wild. I don't mind RR, but after about 20 minutes out of 30 I want to turn her perky smile and increasingly annoying chattiness off. * I thought long and hard about how to describe my relationship with this boy (b/c he was a boy back then, just as I was still a girl). I just couldn't justify "boyfriend", although there were those who referred to us in "boyfriend/girlfriend" terms. It was a nice little relationship, but a short-lived and not particularly serious one on either of our parts. In a strange ironic twist, which appeals to me, he is on the Barnes and Noble list this week, along with Rachael Ray. How cute - together on my blog, together on the list!